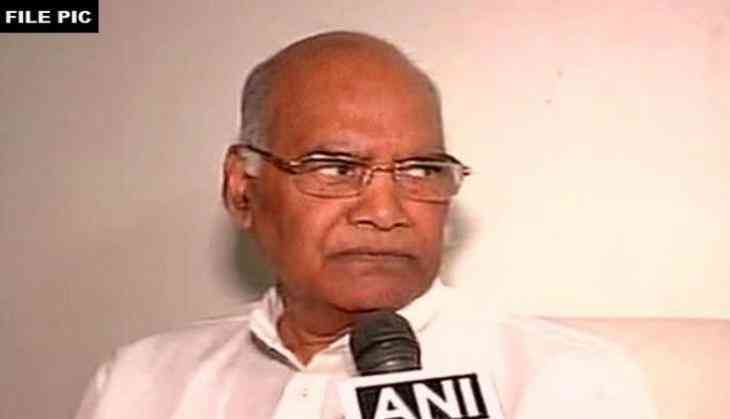 NDA presidential candidate Ram Nath Kovind will today meet MLAs of PDP, BJP and Peoples Conference as part of his campaign for the July 17 election. Kovind arrived here in the afternoon and is scheduled to hold a joint meeting with the MLAs of PDP, BJP and Peoples Conference -- coalition partners in the state government -- later in the day, officials said. A senior PDP leader said the meeting is scheduled to take place at the official residence of Chief Minister Mehbooba Mufti and all MLAs of the ruling coalition are expected to attend it. The PDP-BJP coalition enjoys support of 58 MLAs and seven MPs from the state. Jammu and Kashmir Legislative Assembly has 89 members -- 87 elected and two nominated -- who are eligible to vote for electing the 14 President of the country. The state also has 10 MPs -- six in the Lok Sabha and four in the Rajya Sabha. While one MP each belongs to opposition Congress and National Conference, the Anantnag Lok Sabha seat is vacant as by-polls to it were cancelled in May this year following large scale violent protests in south Kashmir. Get set for Tomorrowland 2017! READ NEXT >> Get set for Tomorrowland 2017!